Cleats. Cleats have been the bane of my cycling life. Having failed to master them, I feel like I have failed at being a proper adult. So, on walking into GFX gym in Business Bay to try out The Trip, the latest fitness sensation by Les Mills, my heart sinks when I see that the static bike I will soon be riding has cleats. Luckily, help is at hand. Deepak Lalvani, the owner of GFX and the man who has brought The Trip to the Middle East, explains why we are all there as he clips me into my pedals. Walking in, the space feels more like a private screening room than a gym, with a curved screen taking up an entire wall. Facing it are tiered levels, each sporting a single line of static bikes. “We had to purpose-build the studio, with a screen and state-of-the-art projectors, using the same laser projectors that go into a movie theatre. In fact, we built a theatre for The Trip,” Lalvani says. Unlike regular cycle classes, there is no instructor’s bike in front. Instead, we are all in rows and student and trainer ride side by side. Once I’m on my bike, the lights fade and the screen lights up with vivid computer graphics. Loud music sets the pace as an imaginary world unfolds in front of us and our instructor, Urosh, leads us on. This kind of computer landscape will be familiar to gamers, but for me it was like racing through Willy Wonka’s Chocolate Factory. “It’s the gamification of exercise. It’s a hybrid. Kids these days love gaming, so this is bringing the two together,” Glen Stollery, head of Les Mills Middle East, explains. Racing along virtual paths, Urosh keeps us motivated to maintain the pace and resistance needed for each stage. Almost shoulder to shoulder, it feels like we are in a peloton as we bank into the corners in a make-believe world. At first the landscape is grey, but as we move through it becomes more colourful. By the end, it is in vivid technicolor, and erupts into celebratory fireworks. I was warned in advance that the movement of the graphics might make me feel a little queasy, but even so, I am astonished how easily my brain is tricked into believing that I am swooping down a path that rolls like a roller coaster. I admit that, at times, the visuals leave me feeling a little overwhelmed, but at any point I can just look down at the floor to break the spell. And this is the interesting thing about The Trip. It is so absorbing and so immersive that it is easy to overlook the fact that this path that you are tearing down at top speed doesn’t actually exist, that it is all an illusion. I have to agree. 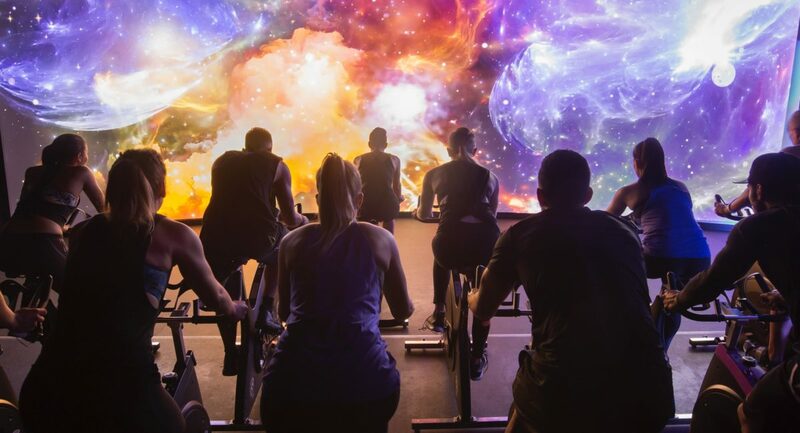 I am so enthralled by the fun, the energy and the muscle-shattering workout, that I totally overdo it and barely have the strength to unclip myself from my peddles at the end. The cleats win again. Copyright 2019 - GFX All Rights Reserved.